Generally, a mobile Java application consists of several modules called classes. 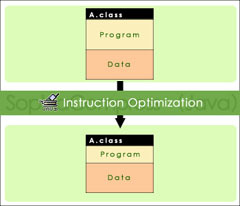 Each class can roughly be divided into two parts: data and a program that operates data. 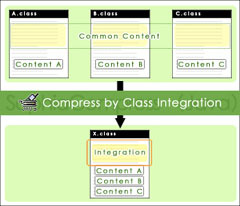 SophiaCompress(Java) OASIS optimizes a Java program in execution format and minimizes it with the compression mechanism as shown in the left figure. Moreover, SophiaCompress(Java) OASIS modifies the contents of an ADF file, such as a JAM file for DoJa and a JAD file for MIDP, and preverifies the compressed program automatically. 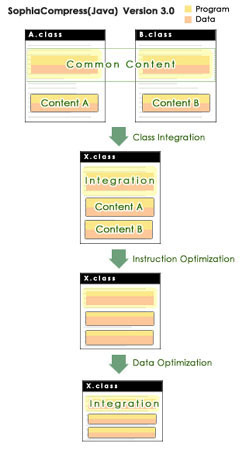 Class integration is a function that combines more than two class files into one file that includes all functions. It enables the program to share data in all class files, therefore the bigger the number of classes the higher the compression rate. Since the memory requirements of mobile Java applications have become so big, with several different functions in different classes, this technology is very effective. An instruction is a statement in a compiled program. By replacing instructions with shorter ones, total size of an application is minimized. Data optimization is a function that minimizes a program by removing unnecessary data or by sharing common data in a JAR file.